2,000 YouTube Subscribers! Thank You! When I first started I didn’t think that I would be able to hit 2,000 subscribers. Thank you from the bottom of my heart. I know that 2k subscribers is nothing comparing to other similar youtubers but this is just the beginning. I will continue sharing knowledge and love. Thanks again for being a subscriber and a supporter! Join me on my journey to free home recording knowledge! Follow me on youtube here! 3,000 YouTube Subscribers! Thank You! Landr Mastering Review – Robot Mastering? [ GIVEAWAY ] Focusrite Scarlett 2i2 – Enter Contest! Thanks for 2,000 subs! 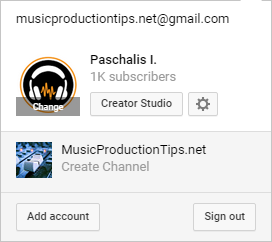 You can unsubscribe anytime with 1 click. Congrats! I’ve come across some of your videos and they are really informative. Useful for beginners, that’s for sure. But maybe you can speed up the things a little, just an advice. Keep doing great tutorials! Thanks!